Developing self awareness is the first step toward increasing your emotional intelligence (EI), and improving your overall quality of life. It's really the beginning point to everything. I know, that's a big statement, but think about it. Your self is the filtering system with which you select and judge everything you perceive, think about and focus on. If you don't have self awareness, you don't really know why you are experiencing life as you are. Have A Question Or Story To Share About Self Awareness? Take a look at this image below. It shows the results of high and low levels of self awareness. When you have high levels of self awareness, you understand your own strengths and weaknesses, which allows you to have more empathy and understanding of others. This opens your heart to a greater capacity for compassion. Compassion means "feeling with," and you can only do this when you have a strong positive emotional connection with yourself. With low levels of self awareness, you do not know your own blind spots and weaknesses. This makes you more afraid when you see the limitations of others, causing you to judge and project your fears outward. Then you are unconsciously driven by your own prejudice, fear and bias, often without even knowing where all of these strong emotions are coming from. a) What are your best and worst memories? 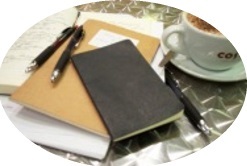 Write about them in detail, placing primary emphasis on your earliest recollections. Take your time, and give yourself breaks during this process. Memory often returns on its own schedule, so be patient and allow the important memories to surface in your developing self awareness. b) As a result of these experiences, what did you conclude about yourself, other people, trust, safety and life in general -- positive, negative and in between? Write down all of those conclusions, and keep track of those notes. c) Those conclusions are actually your beliefs. They are like decisions you made on a subconscious level, based on your emotional memories. Out of your list of beliefs, which ones add to or take away from your self worth and value as a person? Make two lists, one for beliefs that are to your benefit, and one for beliefs that do not serve you well...even if (especially if) you still believe that they are true. a) You may be able to do this with a journaling process. Dr. James Pennebaker's research has shown clearly that writing about past emotional experience is very healing and beneficial. It's free, easy, and do-it-yourself. b) To deal with particularly traumatic experiences, imagery processes such as inner child work are extremely beneficial. These exercises activate your right brain, which activates emotional healing. c) Professional counseling for the purpose of emotional healing and family of origin work may be indicated, depending on the depth of the psychological and emotional wounding that occurred. This type of deep personal healing can be greatly facilitated by the presence of a stable and skilled health care worker. Know your beliefs, and your emotional and behavior patterns. a) You already have a list of your beliefs, divided into two parts as recommended above. Review your list now, and add any additional beliefs that come to mind. b) Now look at your emotional patterns, in terms of how you express your joy, love, anger, fear and sorrow. All of these emotions are important, and need to be expressed in healthy ways. c) Journal about how you experience and express each of those emotions, paying special attention to patterns. Watch for repeating patterns of emotional expression, such as depression, anxiety and anger. d) Finally, in your developing self awareness, look for behavior patterns that go along with the emotional patterns. This may take some time, but it's well worth the effort. Once you see the behavior patterns, you can begin to interrupt them. Without this awareness, you will be blindly driven by subconscious processes outside your control. The heart of the matter when it comes to developing self awareness is your personal spirituality. This may be associated with your religion, or a part of your own belief system. 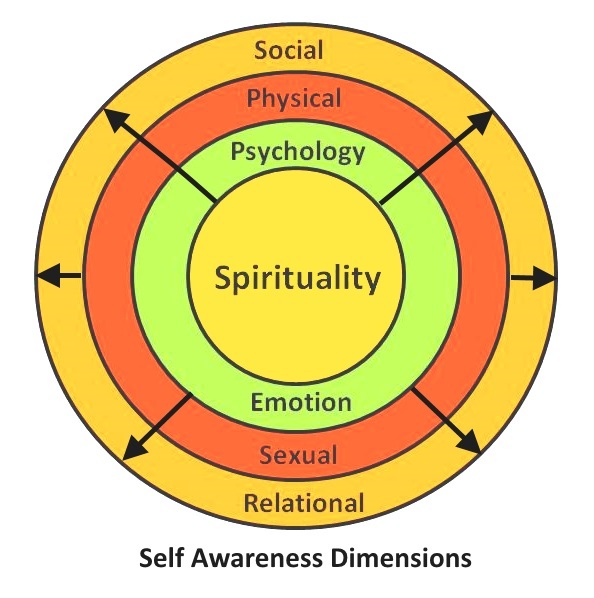 Your spirituality is closely connected with your psychological and emotional patterns, which manifest in your physical, sexual and social expression. 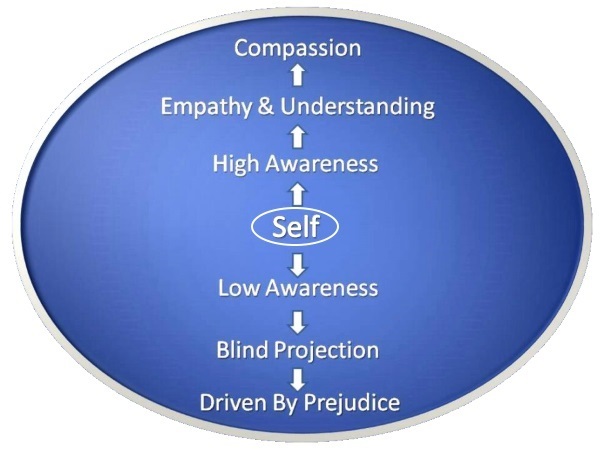 Self awareness requires that you have a clear and strong understanding with each of these levels. One of the best ways to develop self awareness is with the use of imagery. Think about it...how do you look inside? How do you listen inside? With your imagination. Your imagination is the creative mechanism of your mind, and it is also your vehicle for self exploration and developing self awareness. "Imagination provides the eyes and ears for inner work and developing self awareness." I know, this still doesn't give you the tools you need. I've got something that will really help you. 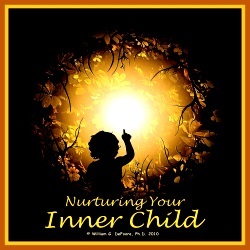 This audio program, available as a CD or in MP3 download format, will actually guide you through the process of visualizing, talking to and nurturing your inner child. This program will enhance your self awareness. Listen to a free preview, then get your copy and start the benefits right away. Thanks for stopping by, and reading this entire page. You can succeed in raising your self awareness, and continuing your journey to greater levels of emotional intelligence.